Nov. 27, 2018 Mariner Papeete to Auckland The following experience optimizes what makes a Regent Cruise so wonderful. It&apos;s the exceptional, sincere, and kind individuals that work together to create for guests a once in a lifetime celebration and memories. We chose this trip because we vowed to return after 20 years to the places where we honeymooned. I mentioned to Sunil, our butler how my husband John was my hero and superman for when he married me, a widow, he took on the responsibilites of two greiving teenagers and ill and declining parents. I wanted to thank him with a surprise German themed evening of food and music. It brings back his happy memories of his parents of German descent. I thought we might have dinner in our suite and perhaps hear a couple German tunes where the musicians were playing that evening. Here&apos;s the amazing evening that Sunil flawlessly executed with the help of Marius, Chef Wesley, Kasha, Anyje, Boogie, Zach and their fellow performers. When we returned from our shore excursion, Gretchen and Deborah who kept our room always tidy, had beautifully decorated our suite. 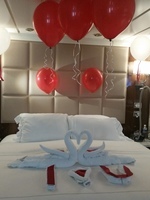 Towels were creatively transformed into swans forming a heart messaging I ♡ YOU on the confetti strewn bed. Red and white ballons with ribbon streamers were everywhere. We were then invited to the Mariner Lounge where Kasia and Antje greeted us in their German durndl dresses. They had planned a unique and upbeat show of beer toasting, music, song and dance. The girls wisked my joyful husband to the dance floor where he joined the dance and returned misty eyed. I am amazed how they came up with such a professional costumed show with such short notice. Brendon and Nathan said they had just finished learning their parts that afternoon. You would never suspect as it was executed with perfection and all in attendance throughly enjoyed the upbeat energy of their performance. 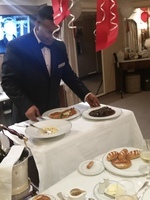 We then returned to our suite for dinner where Marius and Chef Wesley wished us a happy anniversary and presented all of John&apos;s favorite German dishes: his mother&apos;s Sauerbraten, schnitzel, spaetzley, pretzels and Asparagus soup served with a nice Reisling wine. I had mentioned to Sunil that John enjoyed a cigar and whiskey after dinner. He suggested that a taste of Louis XIII Cognac would make a nice gift from me. I agreed so we surprised John once again with a stroll to the cigar lounge were Sunil made a white gloved ceremonial presentation of this special indugence. We then caught John, the cruise director&apos;s excellent show. 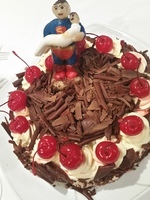 When we returned to our room there was yet one more surprise: a black forest cake topped with a fondant sculpture of Superman carrying me reminiscent of our original wedding cake. John&apos;s dad was a master baker and played trumpet in a German folk band and he would have been impressed. We were never charged for any of this. Regent doesn&apos;t nickle and dime you. They just treat you special all the time. We love that you never put your hand in your pocket once on board. You just sit back enjoy and let them pamper you So you see all of these wonderful individuals went over board to gift us an evening we will forever cherish. They make a Regent cruise special. Special German anniversary dinner served in our room. The following experience optimizes what makes a Regent Cruise so wonderful. It&apos;s the exceptional, sincere, and kind individuals that work together to create for guests a once in a lifetime celebration and memories. We chose this trip because we vowed to return after 20 years to the places where we honeymooned. I mentioned to Sunil, our butler how my husband John was my hero and superman for when he married me, a widow, he took on the responsibilites of two greiving teenagers and ill and declining parents. I wanted to thank him with a surprise German themed evening of food and music. It brings back his happy memories of his parents of German descent. I thought we might have dinner in our suite and perhaps hear a couple German tunes where the musicians were playing that evening. Here&apos;s the amazing evening that Sunil flawlessly executed with the help of Marius, Chef Wesley, Kasha, Anyje, Boogie, Zach and their fellow performers. When we returned from our shore excursion, Gretchen and Deborah who kept our room always tidy, had beautifully decorated our suite. Towels were creatively transformed into swans forming a heart messaging I ♡ YOU on the confetti strewn bed. Red and white ballons with ribbon streamers were everywhere. We were then invited to the Mariner Lounge where Kasia and Antje greeted us in their German durndl dresses. They had planned a unique and upbeat show of beer toasting, music, song and dance. The girls wisked my joyful husband to the dance floor where he joined the dance and returned misty eyed. I am amazed how they came up with such a professional costumed show with such short notice. Brendon and Nathan said they had just finished learning their parts that afternoon. You would never suspect as it was executed with perfection and all in attendance throughly enjoyed the upbeat energy of their performance. We then returned to our suite for dinner where Marius and Chef Wesley wished us a happy anniversary and presented all of John&apos;s favorite German dishes: his mother&apos;s Sauerbraten, schnitzel, spaetzley, pretzels and Asparagus soup served with a nice Reisling wine. I had mentioned to Sunil that John enjoyed a cigar and whiskey after dinner. 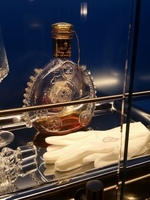 He suggested that a taste of Louis XIII Cognac would make a nice gift from me. I agreed so we surprised John once again with a stroll to the cigar lounge were Sunil made a white gloved ceremonial presentation of this special indugence. We then caught John, the cruise director&apos;s excellent show. When we returned to our room there was yet one more surprise: a black forest cake topped with a fondant sculpture of Superman carrying me reminiscent of our original wedding cake. John&apos;s dad was a master baker and played trumpet in a German folk band and he would have been impressed. So you see all of these wonderful individuals went over board to gift us an evening we will forever cherish. They make a Regent cruise special. Very quiet. Don&apos;t shy away beacause its at the end and near elevater. You are divided by a door. Great size and convieniences. Spent day with oola la tours on beautiful private island . Nice afternoon at a pretty resort with a nice pool with swim up bar and beach with kyacs. Served a very nice buffet lunch and nice native show. Only complaint is no cabans to changed out of swim suits. Used small bathroom with 2 stalls inadiquate for 100 + people. Boat ride was nice. Vanilla plantation was a small home farm where growing explained. Then were to go to a pearl farm but never saw one. Instead taken to area for a nice lunch of local food where guide explained how pearls farmed. Rained. The music and coconut demonstration were fun in spite of the relentless rain. Waited hoping it eould let up so we could go to motou. Still poured rain so just picked up a couple brave souls that went to the private motou to snorkle. The rest of group skipped . Wet but fun boat trip back. Best day. Perfect weather. Great helpful guides . Wild Bill took us through rapids and got us to falls first to swim. A real thrill. The village part got delayed and deemed confused. Could have a sub sandwich or native food was good. Sat around too long so no time to shop. But, people lovely.